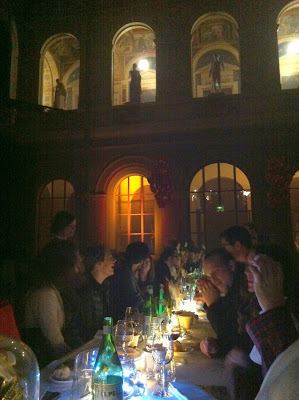 Paris used to be sacred space for me. It was the land of the magical and mysterious. I found that Paris also believed that it was unique and special, unlike all the others. 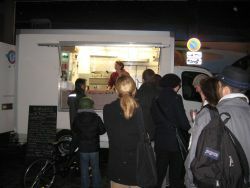 Then the first food truck, Camion Qui Fume, rolled into town. I was supportive as it's owned and operated by a gal from Cali. 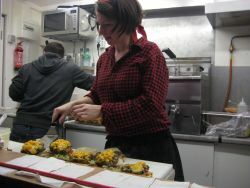 I even waited in a line for over an hour for this tasty, but not an hour's wait tasty, burger sensation. 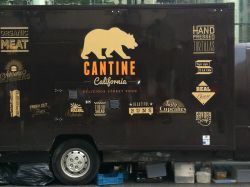 Then came the next truck, Cantine California. 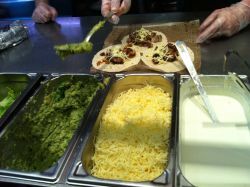 In addition to burgers, they also offered tacos, which I was anxious to get my hands on, only to find dry strands of lifeless pork that pretty much can't hold a candle to any taco truck you can find on any street corner in LA, at any time of day. 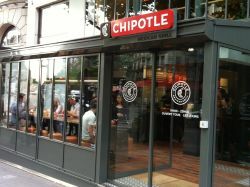 And honestly, even the newly opened McDonald's owned Chipotle that also entered the Paris fray this year packs better favor than Cantine CA. What's next? Gangam Style flashmob in front of the Eiffel Tower? Oh yes, seriously. Look here. The Parisians are intrigued by American trends, even if we can't get them to eat a burger that they've waited an hour for with their hands. 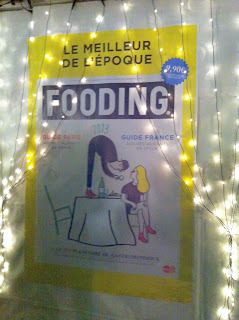 This week-end, Le Fooding, the anti-Michelin French food guide and event group, hosted a food truck dinner party. Always curious to check out a new play on food, I headed down with foodie friends Lisette and Stephanie to see what was happening. After 3 rounds of security checks that I don't even experience when I enter France, we made it into the wet courtyard, encircled by food trucks, layered by newly cold, fall air, and luckily fire pits. Soon we had wine in one hand and hot soup from ChezAline in the other. While I've enjoyed sandwiches from ChezAline, they're not a food truck, though their space is so tiny that it might have qualified them in the minimum size requirement category. We walked around to the other trucks and there was The Morris Truck from New York, only it wasn't their truck as driving across the water isn't as easy as it looks. They are grilled cheese masters, but only had some bread on display. We'd have to wait. Luckily we didn't have long to wait before the dinner bell rang to go into the Ecole des Beaux Arts building where our meal was being served. It was a site to behold when we entered. 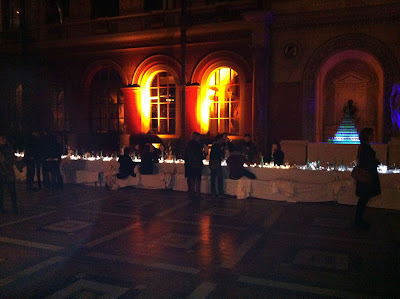 There was next to no light except for a soft strand running down the single, marathon long table in the middle of the large room with a ceiling that nearly stretched to the sky. 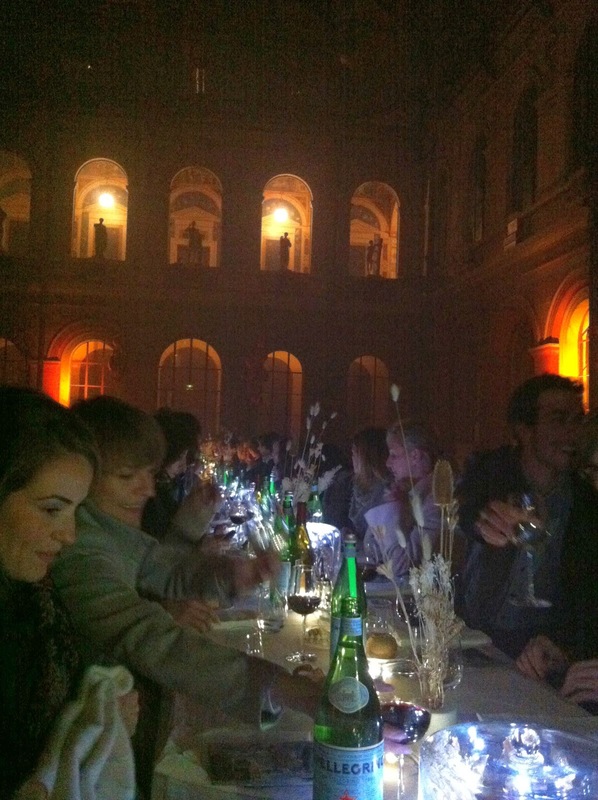 The table was draped in white all the way across and we sat on a long wooden bench that included a blanket for each person to sit on, or wear as it appears our entrance fee did not include heat in the building. That said, we only paid 30 euros for this night, and for the decor alone, we definitely got our money's worth. On all sides of the room were softly lit pedestals where the servers stood like mannequins in full tuxes and tails. 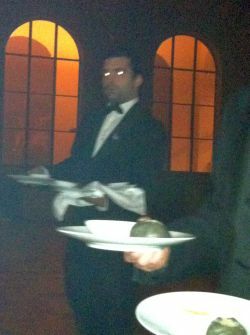 Once everyone was seated, still soft lights came up on the waiters, and they descended their individual stairs to the kitchen where they slowly served each dish. I suppose it had to be slowly with this many people. They put down each dish with the precision of a synchronized swimmer, often with a cascading effect. The light, while beautiful, unfortunately made for some less than perfect pictures, but hopefully you get the idea. Brussel's El Camion & La Buvette kicked things off with some beef and cepes in a soft brioche roll with a sweet dipping sauce. It was difficult to see what was in front of you so biting into things was a fun, exploratory experience. 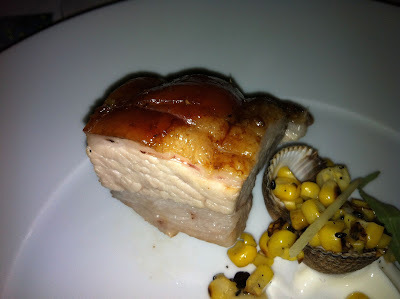 Next up was a beautiful piece of fatty pork with a corn salsa in a tiny clam shell from La Porchetta in Copenhagen. My favorite part was looking around at everyone when it arrived, without silverware. There was never any silverware on the table as we were supposed to be bohemian eaters using only our hands for these food truck delicacies. I do believe that some Parisians passed on this dish as opposed to breaking any French finger eating rules. They did deliver individual, warm water dipping bowls after each course so people didn't turn, or smell, too native. It was a little easier to eat the next course of pizza from Marseille's L'eau a la Bouche. This crusty slice with olives and a wonderful herb mix was remarkably good, which is no easy feat, given the size of the group they needed to feed. Our dessert was the grilled cheese from NY, only it wasn't grilled. It had a crusty bread that gave my teeth quite the workout. There was mascarpone cheese with apple and honey, which didn't really come together for me. 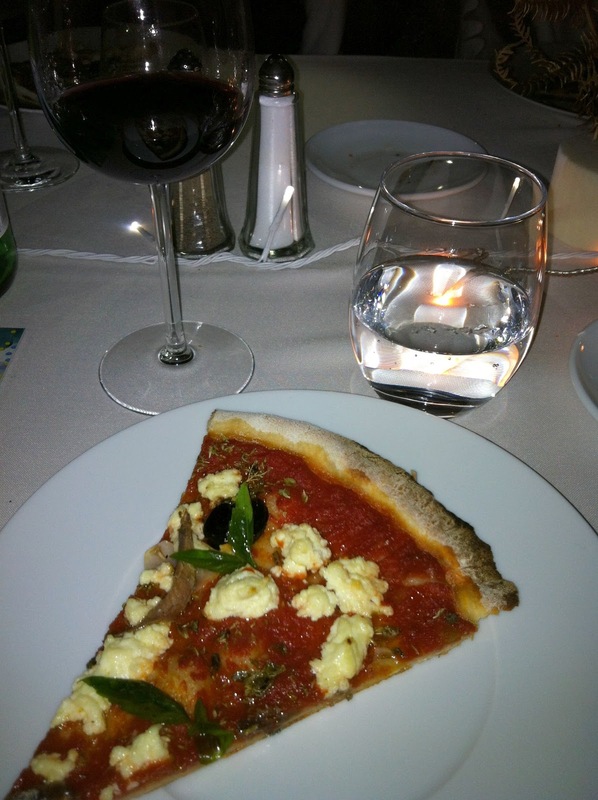 Who would have thought the French pizza would have been my favorite? 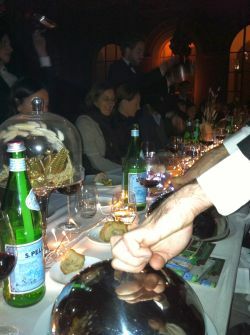 While some American trends are embraced, some will never be, and that's good news for the French silverware industry. It's nice to have small traces of home in Paris, even if they don't always hit the mark. 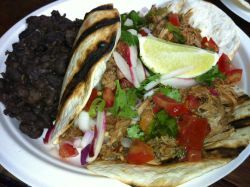 That said, I've decided it's time to pack up the foie gras and head home to taco paradise next month. 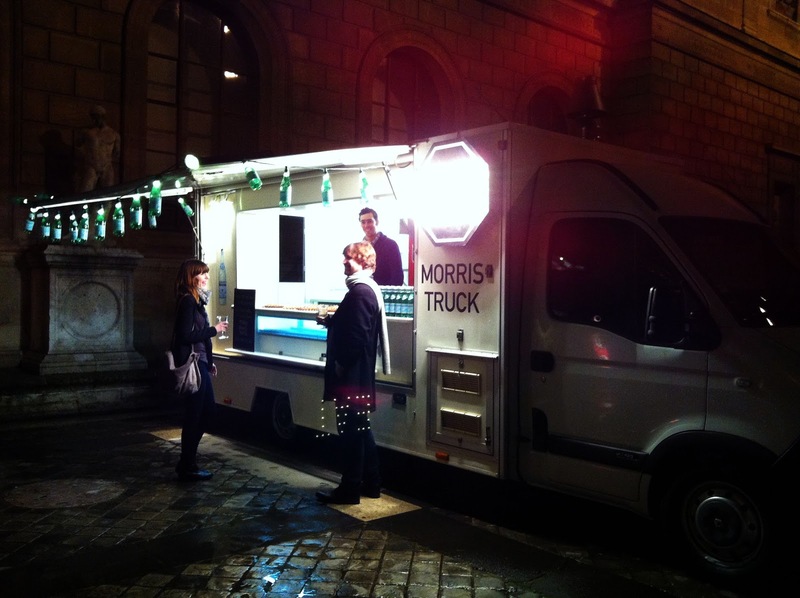 I actually can't attribute the decision to any food group, or even the Parisian's sometimes peculiar ways. Rather, it's just time to refill the coffers, look to the future, and start the next chapter for Page in.....?